So, I've got a roundabout complicated relationship with bowling in real life and in video games. Despite an adolescence spent in the suburbs (what up, Hempstead, Long Island! ), I only first picked up a bowling ball a few years ago. I'm not very good at it, but I think I can be. Video games are to blame for that. The main reason I have delusions of bowling grandeur is because of Tekken Tag Tournament. Namco's 2000 PS2 fighting game included an extra, goofy tenpin mini-game that I played to death. Then, like every human being on the planet Earth during the year after the Wii launch, I got sucked into the semi-real experience of rolling strikes. The appeal is two-fold for me. Firstly, video games are great at simulating physics, at creating speed/distance/inertia chain reactions without any actual physical force being applied. That, in turn, makes me feel more athletic than I actually am. But, Skunk Studios' Gutterball Golden Pin Bowling HD runs away screaming from the simulator goals of other bowling games. I really wanted to hate it at first, with its goofy voices and games-for-your-mom approach. However, it looks better than it has a right to, and traps you inside an insidious grind loop that still manages to be fun. Like many casual games, you're given a choice between grinding your way to progress or buying it. The game's currency comes in the form of its Golden Pins, which you earn as you knock down frames. The better you're doing in a game, the more Golden Pins populate in an alley. You need those pins to open up other balls and venues. The game doesn't hide the fact that there's lots of grind: grind to upgrade the balls, grind to unlock other alleys, grind to get power ups. On top of all that grind, those power-ups let you blow pins away with a bomb blast, steer your ball after release or split it into smaller versions for a spread attack. But, the flip side is if you grind only to harvest Golden Pins, your average can go down. Of course, you can avoid the statistical hit by buying Golden Pins and there's the ugly head of in-app purchasing rearing its ugly head. But I found that trying to avoid any kind of wallet drain AND trying to keep my average respectable created the game's best challenge. Yes, I hated having to bowl the introductory Retro Alley over and over again. But Gutterball gives you enough control over spin and placement that I felt able to consistently roll strikes, thus harvesting more Golden Pins. 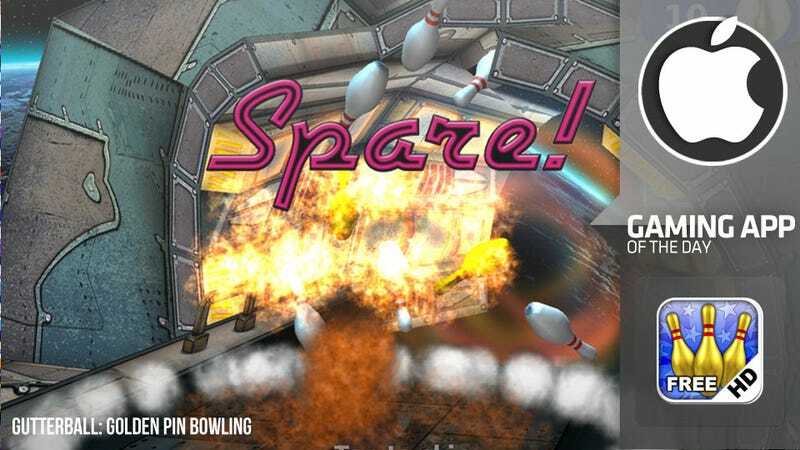 Bowling's a game of angles and Gutterball manages to provide enough leeway to squeak through its challenges without having to charge your way through the game. You can stay out of the gutter, but just barely.